Farm Strategy Step by Step – Entrepreneurship with vision! The step before the training actually starts is already one of the most important. To ensure good training, it is important to have the right people involved and to manage expectations. A good intake can be very helpful. As part of this intake, the motivation of a farmer can be identified: why does the farmer want to participate? It is also important to explain the method of the training: the farmer himself must do most of the work, for an effective training he should participate on all days of the course and also spend time on the homework assignments. An open mind and willingness to share information and interact with colleagues are also preconditions for successful training. Farm size and farm type are, in principle, not selection criteria. In fact, it can be difficult if farms look too much alike. If everybody has the same farm and strategy then it is difficult to inspire each other. Also, if farmers are almost neighbours it can be difficult to create a sense of openness. First the farmers in the group have to become acquainted with each other. This is not done by way of a general introduction where a farmer describes what type of farm he has and how many cows he owns. The opening question is: “What would be your job if you were not a farmer.” For some farmers, this is a difficult question because this is what they always wanted to be or there was no other option. A farmer’s answer gives an insight into his preferences or skills. Some farmers say they would have worked with a breeding organisation. This shows their interest in animals. Others might say they would have been a mechanic. Some say they do not know exactly what other job they would like, but they are sure they want to be independent and want to be an entrepreneur. After this introduction, the trainer explains the principles of strategic management in general and also explains the structure and method of the training sessions. In the last step of the starting session, the farmer shares information with one of his colleagues about the history of his farm and himself. From this information the facilitator can usually extract information about the farmer’s preferences and skills and, of course, also about the farm’s structure. After the introduction the farmer starts working with the ISM tool. The farmer is first guided through a number of open questions about the so called “enterprise factors” (applied to agriculture we can call this farm factors or farm structure). The open questions help the farmer to reflect on his own position. This reflection can be improved if the farmer can compare his own situation and results with a peer group, e.g. 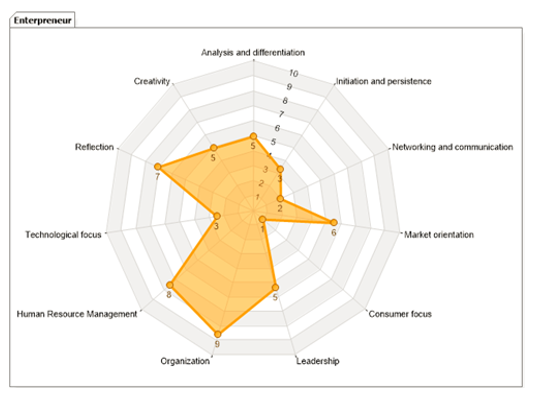 with the help of a benchmarking tool. After these open questions, the farmer has to assess scores for his farm performance on a scale from 1–10. An important aspect of the training is that farmers see that the individual graphs are very different. This emphasises that every situation is different and that a farmer should look closely at his own situation and not just copy the strategy of his neighbour. 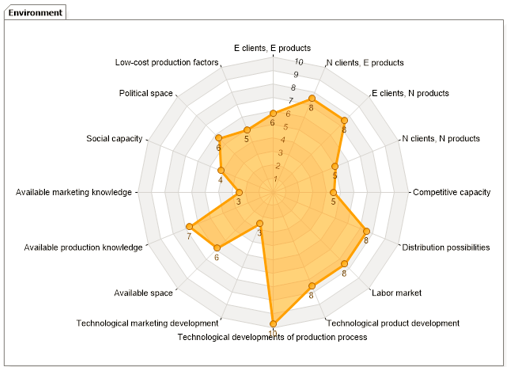 How do “enterprise factors” influence strategy? Old buildings or many different buildings will influence the possibilities of expanding or saving labour etc. This can also be considered in a positive way because if one has new buildings a farmer will not easily replace them with a better type because they still hold considerable value. The business performance is a crucial factor in strategic choices. If the farm performance is on a high level (in several aspects, including technical and financial ones), then the farmer has more strategic options available. If the performance is at a low level, then fewer strategic options are possible. Such a farmer should possibly focus first on improving their farm’s performance before considering new strategies. Again with the help of the ISM tool the farmer answers open questions about the environment. These questions are more future-oriented: what do you expect in the (near) future? The environment includes many different aspects. Of course, the market is very important; for instance, what will be the trend of the price(s) of your product(s)? Moreover, what will be the trend of the prices of the inputs needed for the farm? The local environment is also important; for example, is it possible to expand your farm? What is your relationship like with the neighbours? Which main developments in society could possibly influence the future of your farm? Which technological possibilities are available? It is important to try to stimulate farmers to assess developments with an open mind. A farmer should be prevented from judging too soon that developments are positive or negative because this is related to the (future) strategy. If a farm is very close to a city then this can be assessed as negative if the farmer intends to focus on large-scale farming. However, being in close proximity to a city is very positive for a strategy of direct sales. Different skills are required for different strategies. If you want to sell your own products on your farm, you must have the skills to communicate with customers. If you want to develop a large-scale farm you must be a good organiser and manager. Especially with family farms the farmer and his family have an essential role in implementing the strategy – it is them who have to do the work! This usually means you have to work with the available skills. It is not so easy to hire extra persons with specific skills. Homework assignments: after each training session the participants have to work on assignments. First of all, they can work with the ISM tool at home, they can discuss the answers with their family or with others. The main assignment after day 1 is that they have to talk to an entrepreneur outside of agriculture. A farmer is later asked to talk about how this entrepreneur makes strategic choices, how he runs his business, what his goals are and how he reacts to changes. The goal is for the farmer to recognise similarities in the process of running a business and making strategic choices. The farmer has to prepare a short presentation to share the results with the rest of the group. This presentation provides the starting point for day 2. The crucial part of the training is to make the step from analysing to strategy development. This starts with the farmer’s personal ambitions, what drives him and what his dreams are. A farmer has to come up with at least two options for his future strategy that fit with the analysis he has made. The farmer is challenged to come up with more than one strategy to stimulate him to think ‘outside of the box’. They also use the tool to assign scores to 11 possible strategies. While these are generic strategies and not farm-specific strategies, they can help inspire new ideas. The tool also calculates scores for these 11 strategies based on the score the farmer gave earlier in the training on the three E’s (Entrepreneur, Enterprise, Environment). This results in a graph of strategies with the score the farmer has assigned and the score calculated by the tool. If there are (big) differences between the scores given by the farmer and the calculated scores then it is important to go back one step and see what the main reason for this could be. This step is finalised with a definite choice of a future strategy. 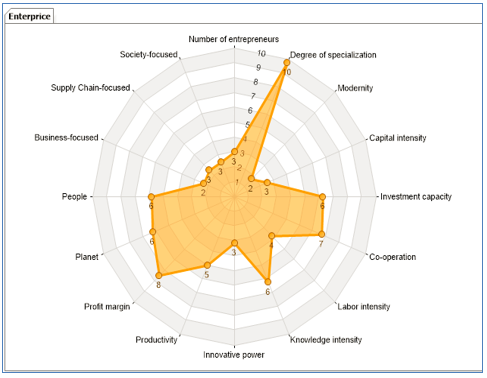 Throughout this publication, the input scores in the spiderweb diagrams are self-reported scores by the entrepreneurs participating in the ISM training programme. 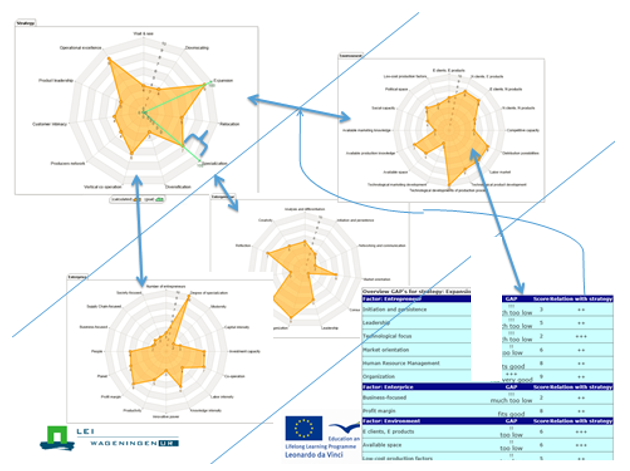 Also, throughout the publication the calculated scores in the spiderweb diagrams are calculated by the tool. The calculation is based on expert knowledge on relations between business and personal factors and strategies. The tool also calculates scores for these 11 strategies based on the scores farmer gave himself earlier in the training on the three E’s (Entrepreneur, Enterprise, and Environment). The GAP analysis will help to analyze Farmer’s Goal strategies and make a solid strategy choice. It is done by comparing your farmer strategy scores and the scores of tool calculated strategy. If there are (big) differences between Farmer scores and the calculated scores then it is important to go back one step and see what the main reason for this could be. This step is finalized with a definite choice of a future strategy. Farmer strategy choice can be the best fitting strategy as indicated by the tool. However, it can also be farmer’s own goal strategy, but in that case attention should be paid to the way in which the ‘gap’ is bridged. If not, the chosen strategy may not be feasible and can lead to disappointment. The GAP analysis is done in three phases, in the figure below explained from the left-upper side to right-under. the calculated and goal strategies, the so-called gap, you can explain why there is a difference? Both for the negative difference and the positive differences. In that case, you can think of alternatives, so that the favorite goal strategy can still be followed? 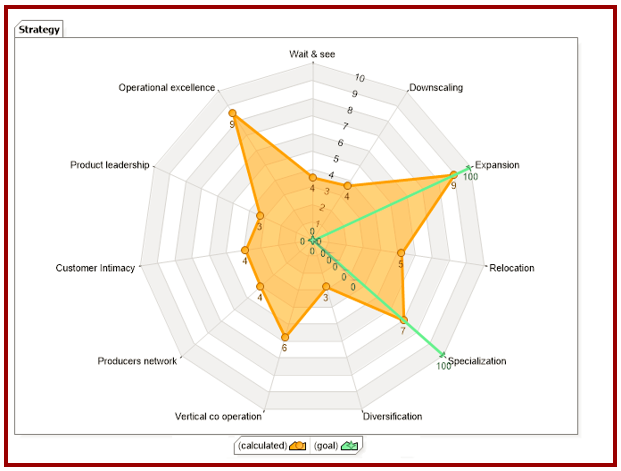 Figure 10. shows that the entrepreneur scores himself at a ‘10’ for the strategy ‘operational excellence’, but the tool indicates the suitability of this strategy at a ‘5’. The second step is to check your underlying radar plots: the enterprise, the environment and entrepreneur. 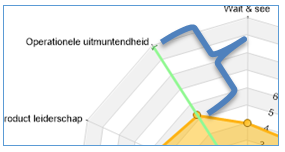 Can a possible gap be explained through low score(s) in the three plots? Do you recognize this pattern? The GAP-analysis shows the factors that you have to work on to follow your goal strategy. Do you recognize the results of this analysis? The column ‘GAP’ shows if there is a gap. A negative gap is indicated through an exclamation mark(s) (!) and the text says ‘(much too) low’. If the analysis indicates ‘May be (more) lower’, then this factor is over-qualified, so to say. In case the first chosen goal strategies were not suitable you can choose to start again the ‘Short Questionnaire to Gain Insight on the Strategy Best Suited to You’. The strategy has been developed, but now the real work starts. A good action plan is important for implementation of the strategy. The action plan should be SMART: Specific – Measurable – Attainable – Realistic and Timely. Each action should have the following elements at a minimum: what will I do, who is involved, and when will it be finished. The goal is to already make a start with the action plan during the training. After the second day of training, when the farmer has made his choice of future strategy, the farmer is given a personal assignment for the last meeting. This assignment depends on the strategy the farmer has selected. If his strategy includes a major investment, then the assignment might involve doing a ‘reality check’ of this investment: what are the costs and what are the anticipated returns? If the new strategy is focussing on developing new markets, then the assignment could be to make contact with possible buyers and discuss the possibilities. After the training, the farmer has both a strategy and an action plan. It is important to monitor the progress of the action plan. If it becomes clear that certain goals cannot be achieved, for example due to changes in rules or legislation, then it may be necessary to go back and repeat earlier steps in the process and adjust the strategy. Preferably, the facilitator of the training also supports the farmer with the monitoring and implementation of the action plan. For the last meeting of the training, the farmers prepare a (Power Point) presentation of their strategy. This presentation includes the analyses, an explanation of why this strategy was chosen, and the action plan. Depending on the chosen strategy, each presentation should also include an individual part. If his strategy includes a major investment, then the ‘reality check’ of this investment could be included in the presentation: what are the costs and what are the anticipated returns. At this meeting, each farmer presents his strategy to the group and a discussion of it follows. This presentation can also be used later by the farmer to share his strategy with people working on his farm or with other stakeholders (e.g. a bank or a supply chain partner).